This site aims to bring together the various research activities that focus on the Angevin space, while offering a platform for scientific exchange and tools for concerning the social history of the State apparatus. At the origin of this site is a research team formed during a research program dedicated to the movement of officers in the space controlled by the two houses of Provence-Anjou-Sicily and their Hungarian and Polish branches. This program, called EUROPANGE, was conducted between 2014 and 2018, with external funding from the National research agency (Agence nationale de la recherche), and as part of a five-year contract of the École française de Rome (Line 4 « The Italian social and political laboratory », Theme 11, « Officers in Angevin Europe »). The unwavering support of this institution since 2010, under the auspices of the Director of medieval studies, has allowed a new development in this field of research. This website is the latest development in a long period of renewal in Angevin studies, which first emerged during the 1990s as evidenced by the contributions of a number of scholars and research teams, as well as other publications. Whilst this research area was highly productive between the nineteenth and twentieth centuries, the destruction of the Angevin registers preserved at the Archivio di Stato di Napoli in 1943 led to a notable desinterest in the subject. The later ‘restoration’ (ricostruzione) of the Angevin registers, promoted by the Neapolitan archivists and the Accademia Pontaniana, marked the first stage of this revival, which followed the publication of influential monographs on the Angevin monarchs by Peter Herde and Joachim Goebbles (these, however, relied more on sources coming from the Papal States). Since 1995, Angevin studies have been the subject of a number of international conventions, especially thanks to the support of institutions such as the École française de Rome and the Istituto storico italiano per il Medioevo. The milestone publication during this period was a collection of essays on the Angevin State (1996) and from 1998 to 2011 many more conferences and seminars were edited. They contributed to a much greater knowledge and understanding of various aspects of the Angevin monarchy, which include: aristocracy, the practice of government, diplomacy, clerical culture, the network of officers and their movements throughout the Angevin dominions. The Università degli Studi di Napoli Federico II, professor Giuseppe Galasso in particular, have provided key support for research on the Angevin dynasty; they were then followed by other universities such as the Universités d’Angers the University of Aix-Marseille, and the Hungarian universities of Pecs and Szeged. In the same spirit, the EUROPANGE project has also promoted a series of annual meetings between 2013 and 2017 and organized a number of exhibitions to increase the public's interest and engagement in Angevin studies. This portal, in the context of this recent revival within Angevin studies, this portal provides a number of research tools. Firstly, it includes a database of prosopographical information on the central and peripheral officers of the various Angevin dominions between the thirteenth and fifteenth centuries. This database has been developed by the laboratory UMR LIRIS, under the management of Maryvonne Miquel and Anne Tchounikine. Secondly, it offers a corpus of digitized manuscript sources, which will be gradually uploaded onto the site. Thirdly, a section of the website is dedicated to online publications, including journals, such as Mémoire des princes angevins and Provence historique, as well as a collection of unpublished sources. The latter will include both an online edition of sources and several research tools for navigating published sources, such as the Enquête générale de Leopardo da Foligno en Provence. 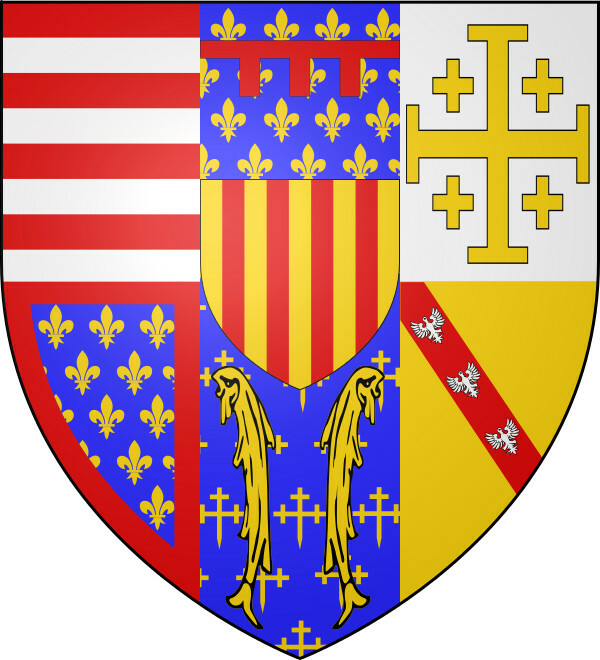 Finally, this website also offers various bibliographies related to Angevin studies, a schedule of upcoming conferences and meetings, links to other useful websites, and information about research projects and institutes dedicated to the study of the Angevin dominions. 1998 : G. Galasso, Il Regno di Napoli. Il Mezzogiorno angioino e aragonese (1266-1494), Torino, 1998. 1982, Palermo, Trapani, Erice: La società mediterranea all'epoca del Vespro, 11o Congresso di Storia della Corona d'Aragona, Palermo, Trapani, Erice, 23 - 30 aprile 1982, Palermo, 1983-1984 (4 vol.). 2007, Szeged, Visegràd, Budapest : Kordé Z., Petrovics I. dir., La diplomatie des États angevins aux XIIIe et XIVe siècles. Actes du colloque international de Szeged, Visegràd et Budapest, 13-16 septembre 2007, Roma-Szeged, 2010. 2008, Salerno : Peduto P., Santoro A.M. (dir), Archeologia dei castelli nell’Europa angioina (secoli XIII-XV), Atti del convegno internazionale, Salerno 10-12 novembre 2008, Firenze, Edizioni all’insegna del giglio, 2011. 2009, Angers : Splendeur de l'enluminure. Le roi René et les livres, a cura di M.-E. Gautier, Angers, 2009. 2014, Napoli : P. Leone de Castris (ed. ), Ori, argenti, gemme e smalti della Napoli angioina, 1266-1381, Napoli, 2014.